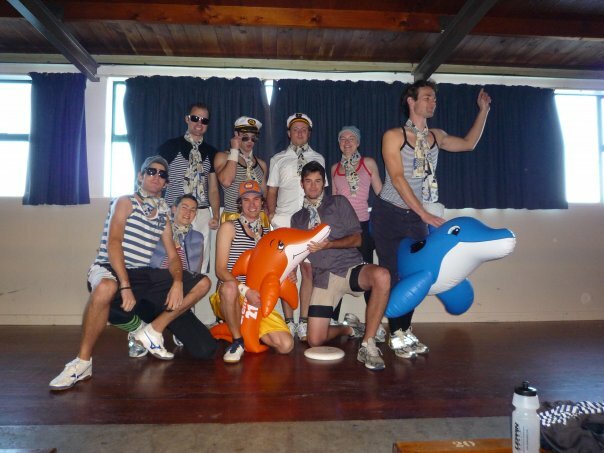 Auckland Ultimate hosts a variety of tournaments and leagues through out the year, and sends teams to a variety of tournaments around the country and around the world. While it may seem daunting, joining a team in ultimate is easy, players are always willing to accommodate newcomers to the sport, you’ll get to play with a variety of people from many backgrounds and skill levels, and there is ample opportunity to progress right up to the elite worlds level. Sportsmanship, through Spirit of the Game, is foremost in the game of ultimate. Competitive play is encouraged, but never at the cost of respect between players. Win or lose, it’s important to have a good time. With good weather and plenty of teams for social competition, spring and summer are the best times to play ultimate. Spring usually runs from daylight savings til Christmas. Summer league runs from early Jan to the end of daylight savings. Corporate and school teams are encouraged to join, and there is likely to be an experienced player around to lend a helping hand. If you don’t have a team you’re still very welcome, bring a friend or just yourself and sign up in a pickup team. There are men’s, women’s, mixed social, and mixed competitive grades. Indoors is four-a-side on a basketball, attacking the basketball key as the endzone. It’s a good introduction to ultimate in a social environment, not least of all because there’s no wind to affect throws. Indoors is usually at Epsom Girls’ Grammar in Autumn and ASB Stadium in Kohimaram in Winter. There is also a schools league during school term time. 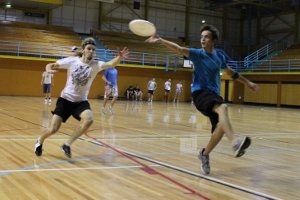 Indoor Nationals is held in September each year in Palmerston North. Expect some tough competition. Outdoor seven-a-side ultimate is great, but sometimes the weather in winter is not. Winter League is run Sundays on turf with mixed teams. It’s semi-competitive and usually blustery so may not be for the faint of heart. However, the camaraderie of scoring a difficult point is undeniable. Savage Sevens has become an annual fixture in Auckland, with people travelling from all over the country to attend. A squad of 8 is allowed per team for the whole day tournament but that doesn’t make it any less hard work with only one substitution per game. “Cold enough to freeze the balls off a brass monkey” is an appropriate term for Rotorua in June. Saturday is indoor team entry with 16 teams, Saturday night is traditionally a legendary party at the KiwiPaka with pool side hat draw (don’t challenge Rob Dudley to a high-five competition), and Sunday is 8 teams outdoor (watch out for the permafrost at Boys’ High, and Brett from Wellington not winning). Rumour has it that Auckland and Wellington once had an argument about who would travel to the other centre to play some ultimate, but a compromise was reached with Taupo. Out of that initial gathering developed Taupo Hat, individual entry outdoor mixed ultimate, where everyone is welcome and only the party is not for the faint of heart. It usually happens in October when the mornings are crisp and the days are gorgeous. New Zealand is surrounded by the sea with gorgeous beaches, so you’d hope that there would be some brilliant beach tournaments on offer, and you wouldn’t be wrong. Flat Out at Nelson Beach is the biggest, usually held at the end of the year except when the tides don’t play nice. They kept winning party of the year at the NZU awards so that award is no longer given. 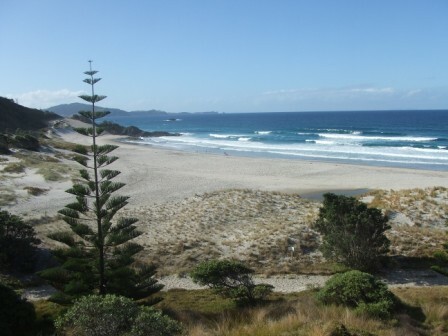 Ocean Beach at Whangarei Heads is a darn good tournament, and can at least claim to be New Zealand’s most northerly. The surf lifesaving club provides the ideal base to play beach ultimate, one game at a time – everyone gets to watch the other games or duck off for a swim. Ultimate can be played with single or mixed gender teams. In spring New Zealand holds mixed tournaments and in late summer open and women’s. Currently there are North Island and South Island Champs, a few weeks before each of the nationals. The Mixed National Championship is usually held in one of the first two weekends in December, and Open and Women’s National Championships are held near the end of March, before the end of daylight savings. Ultimate in New Zealand is slowly but surely growing. The other main centres of Wellington and Christchurch have significant player bases and in 2010 each sent a mixed team to represent New Zealand in Prague (see more below). Hamilton has burst onto the scene in recent years, Palmerston North has Indoor Nationals in September, Nelson has Nelson Beach, and in many major towns a pickup game can be found. World Ultimate Club Championships (WUCC) and World Ultimate and Guts Championships (WUGC) are held every alternating four years. WUGC was held in Heilbronn, Germany in 2000, Turku, Finland in 2004, Vancouver, Canada in 2008, and Sakai, Japan in 2012. One team represents their country in Open, Women’s, Mixed, Masters, and Women’s Masters grades. New Zealand’s best results are bronze, for the Mixed team in 2004 and for the Master’s team in 2008. WUCC was held in Honolulu, Hawaii in 2002, Perth, Australia in 2006, Prague, Czech Republic in 2010, and Lecco, Italy, in 2014. Multiple teams can represent one country in each division. NZ sent two Women’s teams, an Open, Mixed, and a Masters team to Perth, our largest ever contingent to represent NZ in ultimate. Countries like Canada and the US send up to five teams in each division. To Prague New Zealand sent Magon, an Open team from Auckland. Juniors ultimate is growing. In 2012 NZ sent a men’s U19 team to Dublin, Ireland. In 2013 Toronto, Canada hosts the WFDF U23 championships.